In a down month for the up-and-down housing recovery, sales of existing houses fell 3.4% in October from their annual pace in September. The sales rate was up 3.9% from October 2014, the National Association of Realtors reported, though it was the narrowest year-to-year gain since January. The trade association cited the slowing global economy and volatile financial markets for dampening demand for houses while blaming a short supply for rising prices and diminishing choices. The U.S. economy grew at a 2.1% annual rate in the third quarter, up from a 1.5% initial estimate, as businesses had more inventory built up than previously thought. The second of three estimates for the gross domestic product showed consumers spending less than in the first calculation, rising by 3% instead of 3.2%, down from a 3.6% rate in the second quarter. The Bureau of Economic Analysis reported that the core index preferred by the Federal Reserve Board as a measure of inflation rose at a 1.3% annual rate in the third quarter, still below the Fed’s target of 2%. 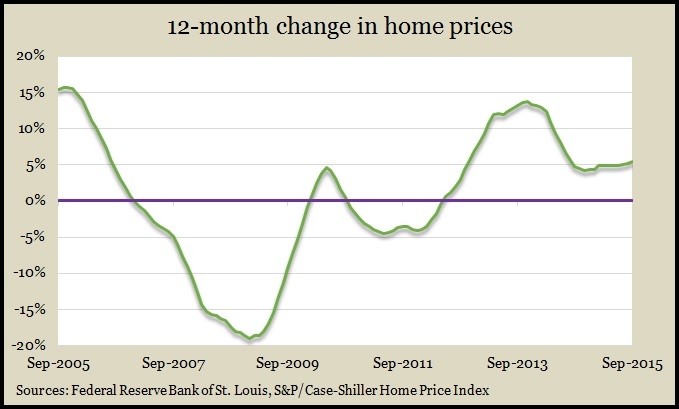 Lack of inventory helped raise house prices 5.5% in the last 12 months, according to the S&P/Case-Shiller index. That’s the highest year-to-year comparison since August 2014. All of the 20 cities in the composite index showed price increases, 17 of them gaining at faster rates than in July. 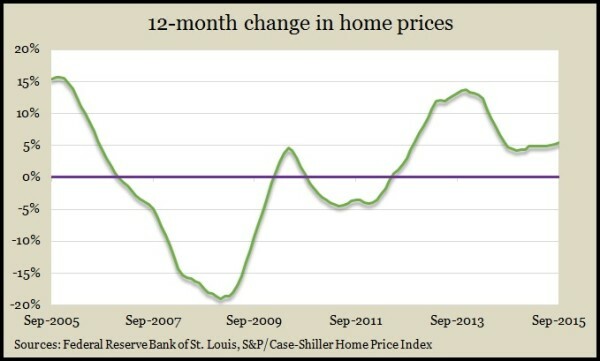 A housing economist for S&P noted that housing continues to outpace overall inflation by more than 2-to-1 and said a boost in short-term interest rates from the Fed should have little effect on historically low mortgage rates. The Conference Board reported that consumer confidence fell in November after a fall in optimism for job prospects in the next six months. The index hit its lowest level in 14 months, disappointing analyst expectations. Consumer assessment of current economic conditions also fell in November, although it remained relatively confident. Plans for buying automobiles rose over the month, but fewer families were less interested in real estate. A volatile measure of manufacturing strength, durable goods orders, rose more than expected in October, mostly because of an increase in commercial aircraft orders. But even excluding transportation equipment, orders rose for the first time in three months, according to the Commerce Department. Orders for non-military capital goods excluding aircraft – an indicator of business investments – increased for the second month in a row, suggesting a positive trend in a sector challenged by slowing global growth and a strong U.S. dollar. Personal spending and incomes both rose in October, although incomes outpaced spending, suggesting consumers are holding back. The result raised the saving rate to 5.6% of disposable income, providing more spending power for the holidays. Over the last 12 months, the Fed’s preferred measure of inflation increased just 1.3%, according to the Bureau of Economic Analysis. The annual sales pace of new houses rose less than anticipated in October but bounced back from a weak bout in September, according to the Commerce Department. The sales rate increased 10.7% from September and 4.9% from October 2014. The inventory of new houses for sales dropped, as did the median sales price. Employers’ hesitation to let go of workers continued to be apparent from the moving four-week average for initial unemployment claims. Although the figure from the Labor Department remained unchanged after rising three weeks in a row, it has remained below the 48-year average since early 2013. Americans ended November less upbeat than they had indicated earlier in the month, though they’re generally as optimistic as before the Great Recession, according to the consumer sentiment index from the University of Michigan. As with the Conference Board survey, the sentiment index showed a lower opinion of prospects six months. Relatively strong feelings toward current conditions have a greater bearing on more immediate spending plans.